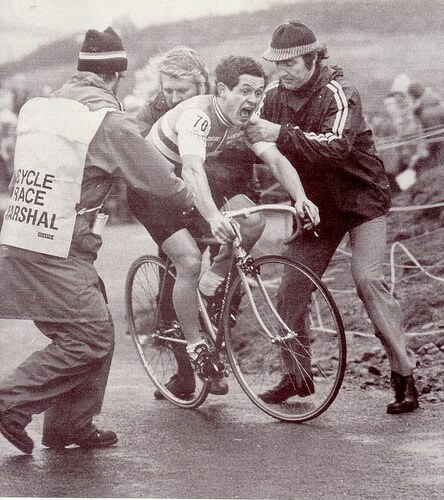 There are different ways of riding hill climbs. One approach is to start very hard and hold on for dear life. The other is to start hard, but then try and put in even more effort in the last section. Evidence of emptying the tank. Both have there merits and demerits, though they usually end up in a similar pain cave at the top. Also like any pacing strategy – they depend on the physiology and capacity of the rider. If you look at splits from national hill climb – you can see quite big variations in the relative pacing strategies. Two people may finish with a similar time, but may have reached the half way point at very different speeds. After the 2013 national hill climb, I started writing about pacing strategies, but then thought better of it and decided to forget all about it. Perhaps I didn’t want to remind myself of the crazy split that emerged between myself and other riders. I took the option to enjoy the winter training without worrying about a pacing strategy that might have been better. As a wise man once said, the best pacing strategy is the one the winner had. It is worth bearing in mind that one person’s best pacing strategy may be different to someone else’s. It depends on your physiology e.t.c. Athletes can have different composition of muscle fibres, different tolerance of acidosis e.t.c. What works for one rider, may not work so well for another. 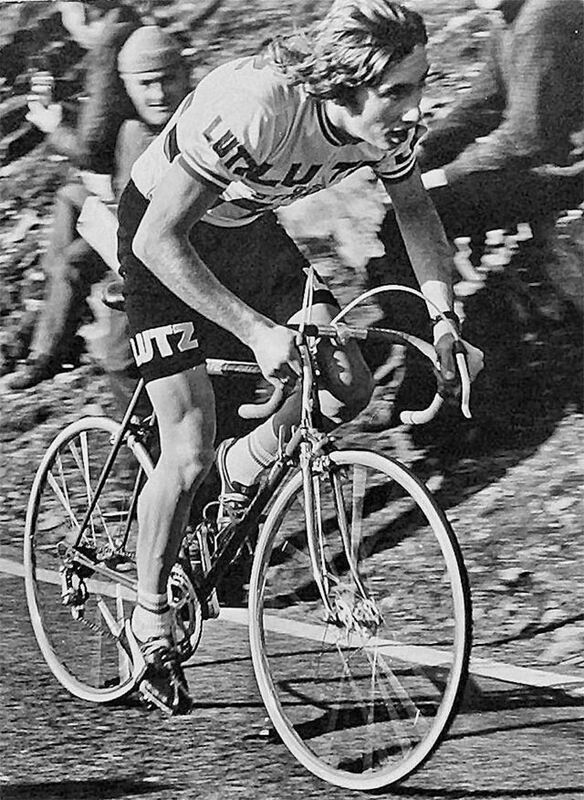 For example, Gordon Wright told me Stuart Dangerfield was always able to start very hard in a 10 / 25 mile time trial. But, this burst of fast twitch muscle fibres and power wasn’t detrimental to his overall performance. Yet, if a rider like myself tried to replicate this pacing strategy of bursting out of the gates, I would pay for it a lot more throughout the rest of the ride. If someone goes faster than you, there is a temptation to think, they must have had a better pacing strategy, and if only I had done the same pacing strategy, I would have done better. This may or may not be true. You have to be careful, from looking at splits and making calculations. If you had gone 10 seconds quicker in the first half, it’s really hard to predict how you would have fared over the last half. The effect of going 10 seconds quicker may very much depend on individual rider. The only reliable way to improve pacing, is to choose a hill and attempt different pacing strategies. Then compare power and timings as best you can. Obviously you need to do when at similar levels of freshness. I think for a climb like Jackson Bridge, riding the climb many times in practise could pay dividends. The important thing is to test pacing strategies in training, and not try something different on the big day. (For example, in 2012 on the Rake, I did several practise runs and did relatively well. Then I assumed for the national I’d be able to do it in a bigger gear and just go faster because it was the national. It didn’t work out. Lesson learned. In the review of Geraint Thomas book, I gave the example, of Chris Hoy and Olympic 1km pursuit in 2004. For me this is the classic example, of not being influenced by what other riders have done. Hoy was in the final where three riders before him broke the Olympic record. In response the Frenchman put on a bigger gear and went out much quicker than ever before. Hoy stuck exactly to his training plan, he’d been working on for four years. The point is that – if you have worked out your optimal gear and pacing strategy – don’t do something different, just because of what other riders may be doing. I remember in 2013 I did a couple of practise runs on the Stang into a strong headwind – getting slow times (12 + 10 minutes). Two hours before the start, a journalist told me that someone had done a very quick 8.05 on Strava the day before. This was massively faster than my training times. But, I didn’t pay any attention to it, and just stuck to the plan for riding the race as I was going to. In the end I think the splits were nothing special in 2013. In fact, quite a few people thought I had won because I was visibly faster over the last half. But, the flip side was that I was much slower over the first half. 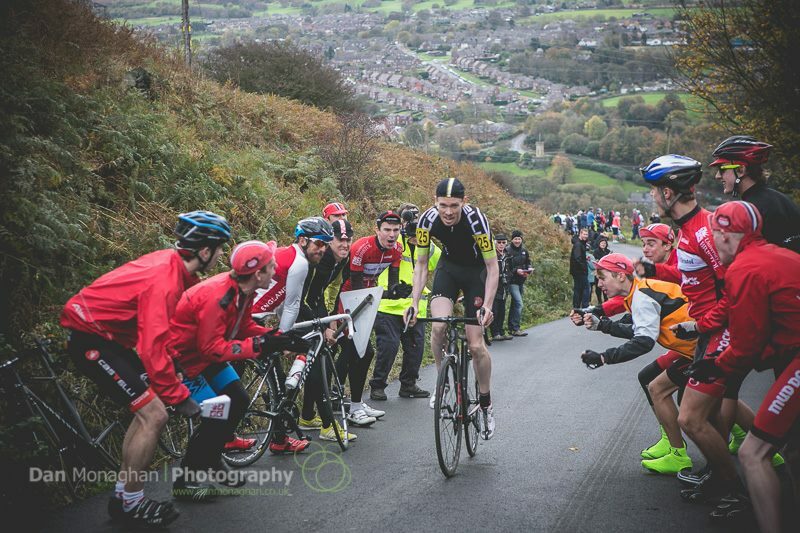 I was 25 seconds down on Dan Evans at the half way point, which in hill climbs is a huge margin. Over the second half, I brought back 17 seconds. But, it is only the final time which counts. I think I had the perfect pacing for a headwind finish. I’d done the course many times in training and it was always a headwind. On the day, there was a massive tailwind over the last half of the course. So it wasn’t an optimal pacing strategy. I was absolutely spent by finish, but putting out more power at the bottom, would have helped. But, I wouldn’t have changed it as much as 25 seconds quicker at the start, and I don’t feel as bad as it might look. I don’t think I missed out on a podium because of pacing strategy, though others may think so. We’ll never know. Interestingly Dan Evan’s pacing was very similar to the way Dan Fleeman rode the climb in 2009 when he won (Pea Royd Lane). Going out of the blocks with very high power can obviously work for some people, but I don’t think it would work for me the same way. 2015 on Jackson Bridge was a really tricky climb to pace because the gradient is variable and steepest section is at the start. Yet, the last section to the finish is also still hard. Everyone suffered on that final slope, but you could lose a big chunk of time there. The funny thing is I felt I went quite hard over the first section! Interestingly the women’s pacing was much more ordered, with much less variation in splits. Sometimes I think it’s six of one and half a dozen of another. Sometimes, I have done wildly different pacing strategies on climbs and ended up with pretty similar times. I thought 2014 was OK. Could I have gone harder on first section? yes. Would it have slowed me down on second half? yes. Could I have got a quicker time by different pacing strategy? Possibly, but also I could have gone slower too. Sometimes, you just have to think a little less and move on. The other complication is that it is not as simple as looking at your power meter. In a hill climb like Jackson Bridge, the power is going to be variable because of variable gradients. As a rough rule of thumb, you want to put out more power, the steeper the gradient is. So in a hill climb like Jackson Bridge, the biggest power output should come in the first minute, where the climb is at its steepest. But, the question is how much more power in first minute? It would be interesting to ask hill climbers, after a race and after seeing splits – whether they were happy with their pacing. I would hazard a guess, many might think, in retrospect, that there were betters ways to eke out their power. But, that is one of the challenges / attractions of hill climbs, it really is a test of pacing as well as physical ability. As a wise man once said – the best pacing strategy is the one the winner has. Power meter or no power meter? A good question is it helpful to use a power meter when racing a climb? It is certainly useful to use and look at power at least in training runs. The first thing I noticed is that when using a power meter is that when it appears effortless (first minute) you can be doing higher than average power. When you’re killing yourself in the last minute the power can be much lower than average. It reminds you that perception of effort may be different to reality. If you have a tendency to sprint out of the blocks, looking at a power meter may help you keep below a certain limit that could be detrimental. Then in the last two minutes, you don’t need to look, but just go as hard as you can. This might be particularly important when you’re psyched up for a big race, where perhaps a crowd cheering you on at the first corner can make you go deeper than you intend. Even if you don’t look at power meter in race, it is useful to have power data to examine after race. It can give indications of poor pacing strategy – for example, if power collapses in last half or if you were too conservative in first half. Hopefully, you can use these power profiles to work on your own pacing strategies. On a personal note, I’m slightly dissappointed I’ve done so many hill climbs without a power meter. This season, Stages power meter broke down at a critical time, just when it would have been helpful to see. It was the same story in 2013, when I bought a Quark power meter in May, but it broke in September and wasn’t fixed until Oct 25. But, on the other hand, it shows although power meter is very helpful, it’s not indispensable. I would also recommend some practice runs / racing – without crutch of a power meter. It’s a good skill to work on, even if you look at power later. For the national hill climb in 2015, I could have used a power meter (fixed at last minute), but I chose not to because I wasn’t go to look at it in race anyway. Of course, now I’m curious to see power profile for race. Whichever way you look at it, Harry Luxton’s splits in 2014 look really strange. The (possibly naive) way I look at it is that you’ve got a finite “pot of power”. You can use it quickly by putting out high power, or slowly with low power. Once your pot is empty then you’ll be limping to the line on guts alone. The perfect pacing is to be emptying the pot as you cross the line. To make things simple, most hill climbs (even in the big mountains) don’t give you any chance for recovery so it should be fairly easy to tell how much you can give at different power levels that will result in an empty pot at the finish if you’ve got an up-to-date power curve. The only real variable is how much harder you go on the steeper gradient sections. Obviously, the harder you go on the steeps, the more gently you must go on the lesser gradients. Does that make sense to you Tejvan? I’ve begun building a pacing tool based on this but interested to know if you agree that this is a sensible approach? Maybe add an positive/negative power split option to suit different physiologies might be useful too? I don’t really know Ben. I don’t really know either Ben. The reverse is also true, if only a perfect race, or even a better than perfect race will get you the place you want, then going out at an intensity that matches that aim might be worthwhile, as while you might “blow up” and crawl to the finish, it was also the only chance you had of winning, and it might be worth the embarrassment of fading so much. Hi Tejvan, as someone just getting into hill climb racing this post is really useful and interesting. As a beginner, I am able to make quite big gains in my speed up a hill just by changing my pacing strategy. As you have said there is so much to think about as it’s not just about the first and second half but the gradients as-well. Knowing a hill well helps a lot but I imagine experience on lots of different hills and knowledge of yourself that you have gained over the years is a big help too. I tend to slack off too much on the less steep sections I think. Something for me to work on…. This has given me quite a bit of food for thought. I finished 153rd with 2:49 first split and 2:52 second split. I seem to have pretty much the slowest first half of anyone, and the second half looks reasonable. I rode to my target average power (as always) and then emptied myself from a pre planned point. This seems different to pretty much everyone else, andi I’ve never noticed before! Clearly I need to at least try a few other strategies. Thanks.